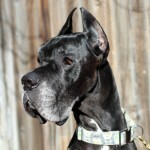 Siere has a home - Rocky Mountain Great Dane Rescue, Inc.
Siere has a home with his Foster mom and dad Sandy & Bill in Denver, CO. This sweet old boy has had a bit of a rough go trying to find his perfect forever home to spend his later years with. Both Sandy and Bill have never had a Great Dane before and when Siere stepped foot into their house he made himself at home as though he just went away for a while. We are thrilled for Siere and his new family. Sandy & Bill have affectionately renamed him Sy. Way to go sweet ol’ Sy!.